Origent’s predictive algorithms permit us to help researchers and biostatisticians discover new knowledge from their clinical trial data sets. Early stage clinical trials are designed to demonstrate safety, and are conducted without a formal placebo or control arm. Efficacy estimates may be drawn from physician’s intuition about whether a patient may or may not have improved. Objective, unbiased measurements of efficacy are difficult—if not impossible—to make in the absence of a control population. For each patient in your trial, create personalized, detailed predictions of how their symptoms likely would have progressed over time, absent your treatment. Generate a virtual control arm that simulates how the trial population or various patient subgroups would have progressed without your drug. 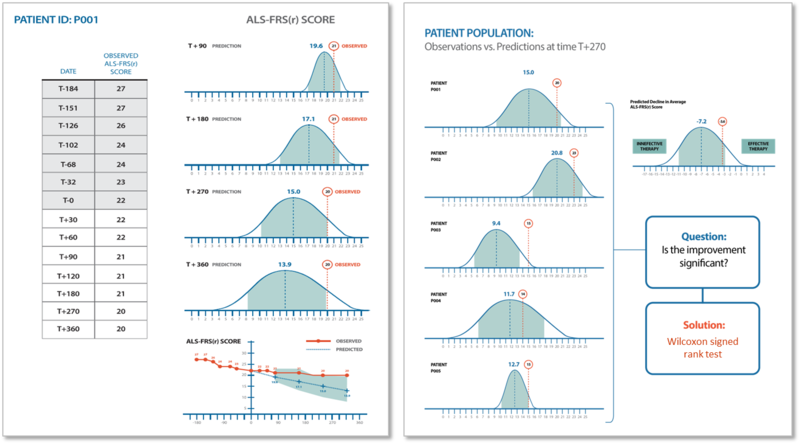 Compare each patient’s disease state over time to their personalized, “absent treatment” progression path. Measure your drug’s efficacy based on each patient’s response, in comparison to their personalized estimated progression path. Identify those patients who likely responded to the drug and estimate the extent of their response. Analyze patient subgroups to isolate responder characteristics and inform additional experiments and subsequent clinical trials. Drug developers make better earlier decisions, navigating successful candidates through the drug development pipeline faster, and terminating failing projects sooner. Pipeline portfolio managers prioritize scarce resources in favor of the drug candidates that are most likely to succeed in later trials. Executives provide earlier evidence to investors, giving them greater confidence in the drug candidates selected for development financing. We are happy to discuss this in depth! Reach out to us — we’ll be happy to answer your questions.